So. Much. Fun! Watch out Cincinnati, Louisville might be in the running for my next favorite family-friendly city. It’s easy to walk around, has some great architectural buildings, lots of fun attractions and is situated along the Ohio River with fantastic views. My husband travels to Louisville frequently on business and we decided to tag along with him for a whirlwind two day trip this summer. Poor Chris, while he worked, we played. We stayed at The Gault House which I envisioned as a quaint boutique type hotel, but sometimes what you envision and what is reality are two different things. The Gault House is a HUGE hotel complex. The bonus is that it has an outdoor pool that overlooks the Ohio River. Our hotel room wasn’t anything too fancy but the beds were very comfortable and the room was clean (no refrigerators or free breakfasts). My girls loved that we got a room on the 16th floor (we requested a river view at check in). They also enjoyed visiting the 3rd floor conservatory which connects the Rivue Tower and the Suite Tower. Here they have a large indoor bird display filled with adorable little birds, plenty of seating and an on site 24 hour “to go” deli/café. Plus there is a cool bar for the adults with a bar top that is unique – it’s one giant fish tank with plenty of colorful fish to enjoy. Lousiville has plenty to do for families and since we were only there for two days, we definitely need to return to explore the city some more. Louisvlille Slugger Museum – This is a must see if you visit Louisville. Any building with the “World’s Biggest Baseball Bat” leaning up against it needs further exploration. Admission to the museum includes a tour of the working Lousiville Slugger Factory. This is one cool tour since you get to see how they make all those wooden bats. Plus you get to feel and touch some of the bats. At the end of the tour, everyone gets their own mini Louisville Slugger bat to take home. 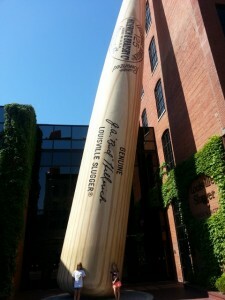 The Louisville Slugger Museum is really interesting and engages kids of all ages. I liked seeing the life-sized baseball players. In the Grand Slam Gallery, the girls got to hold original bats by some famous ball players. They held Johnny Bench’s bat and Joey Votto’s bat. There are also batting cages in the back of museum and it’s only $1 to batter up and test your batting skills. Admission: Adults $12, Seniors (60+) $11, Kids (6-12) $7, Kids 5 & under Free. 800 West Main Street, Louisville, KY 40202. (Note, look for discount coupons to attractions in the lobby area – we got $5 off MegaQuest tickets that we did on Day 2). Louisville Trolley (TARC – Transit Authority of River City) – Louisville makes it easy to navigate their downtown. It is easy to walk but you can also hop on/off the trolley and see more of the city. Plus the trolley is FREE! Click here for the trolley schedule. We took the 4th Street Trolley and hopped off near The Visitor’s Center (401 S. 4th Street). The Visitor’s Center has lots of great information on what there is to do and see in Lousiville and the surrounding area. Pick up a free maps here to help you in your navigations. You can also see a small exhibit on the famous Colonel Sanders form Kentucky Fried Chicken. Plus they have really helpful and friendly staff on site if you have any questions about Louisville as well as discount coupons to some of the local attractions. 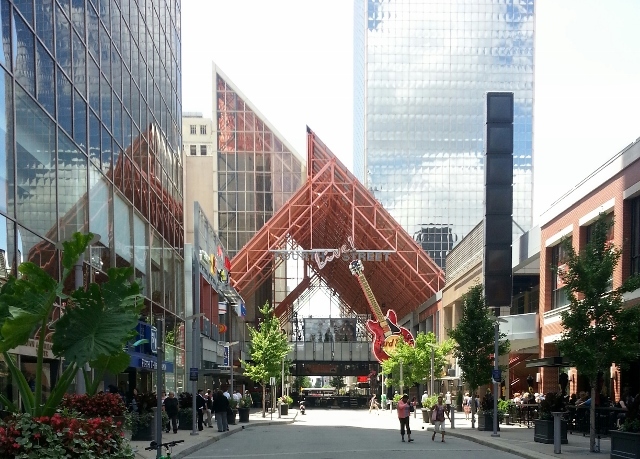 From here, we walked to the 4th Street Live area and had lunch. We then walked back to our car and headed to our hotel for some pool time. Troll Pub Under the Bridge – One thing I didn’t research was where to dine. Louisville has some great places to eat so next time I need to get some tips on where to go. But, we did end up going to a fun restaurant within walking distance of our hotel called the Troll Pub Under the Bridge. The kids liked the big Troll that greets you as you descend to the Pub. Make sure you ask about kids meals since they weren’t featured on the menu but they do have them. I liked seeing all the beer selections on the chalk boards. We all had a great meal and even had a free appetizer thanks to one of the free visitor’s magazines I read. After dinner we took a walk along the riverbank. 150 W. Washington St., Louisville, KY 40202. (502) 618-4829. Louisville Zoo – The Louisville Zoo is about a 15 minute drive from downtown and since my husband needed the car that day, we got a rental through Enterprise. They have a convenient downtown location and they even picked us up at the hotel to take us to the rental car. We really enjoyed the Louisville Zoo. 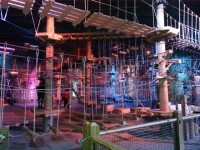 It is open daily and costs $15.95/ages 12 and up, $11.95/ages 3-11 years and $11.50/ages 60+. Be sure to check with your local hotel to see if they offer any discount tickets to go to the zoo. Since we are frequent visitors to our amazing Cincinnati Zoo, I wondered how the Louisville Zoo would compared. Some of the exhibits are smaller but the animals are well cared for and they have some great exhibits to see. 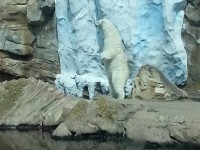 Their polar bear exhibit in Glacier Run is amazing. Plus they have a nice wet playground area for the kids (if it’s a hot day, bring their suit or change of clothes so they can cool off). My girls favorite exhibit was Lorikeet Landing. For $2 you can get some nectar in a small cup and the birds may land on you to enjoy some of that nectar. I enjoyed Gorilla Forest and loved watching these large primates. 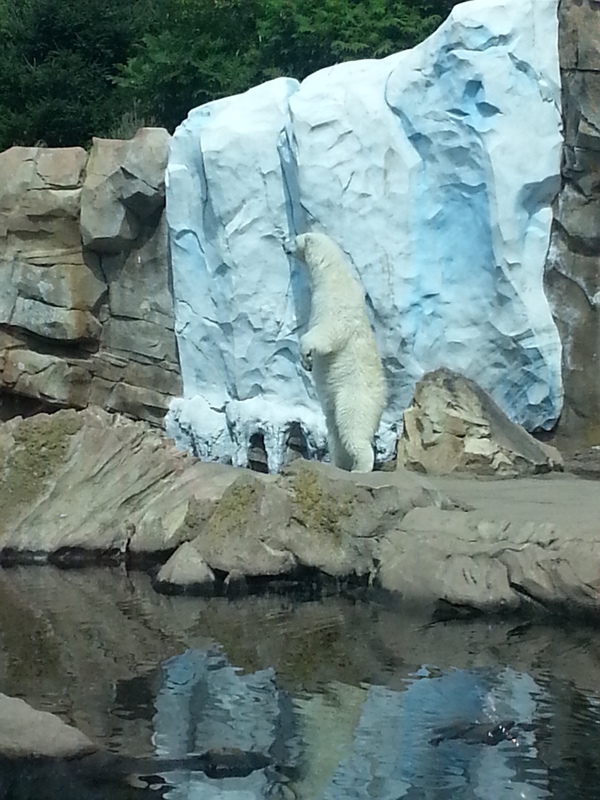 I would definitely recommend a visit to the Louisville Zoo. 1100 Trevilian Way, Louisville, KY 402132. Mega Cavern – Wow! This was the highlight of the trip for my girls. Very close to the Louisville Zoo is Mega Cavern which is a underground mecca of fun. It originally was a cavern for limestone mining and it has a steady temperature of 58 degrees. You will find Mega Quest, Mega Tram and Mega Zips here. We opted to try out Mega Quest which is a underground aerial ropes challenge course filled with lots of climbing, and fun mini zip lines. My girls LOVED it. They get suited up with a lighted helmet, full body harness and belay hooks. Once they go through an orientation they get to enjoy the course as much as they want during their three hour tour time. 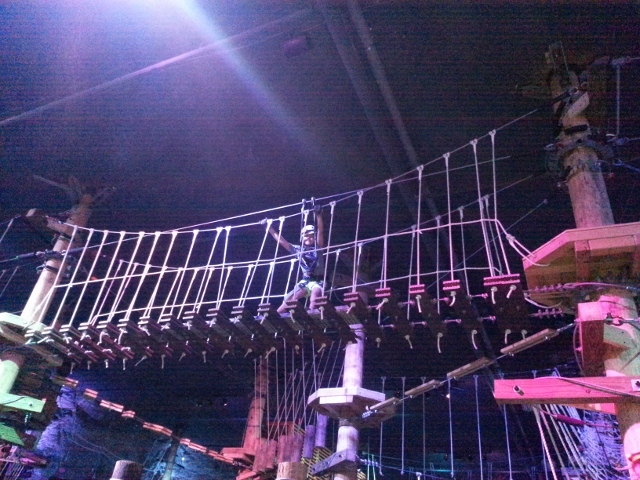 For parents who don’t want to climb, they have a large seating area where you can relax and watch your kids (yes, this is what I did so make sure you bring a book or some magazines). Mega Quest is $29 on Mon-Friday for ages 5-11, $35 for 12+ and on the weekends the price goes up to $35 for ages 5-11 and $39 for 12+. But, if you go to the Louisville Slugger Museum and find the Mega Cavern mini brochure, you can get a coupon in there for $5 off Mega Quest. On our next trip, we are going to do the Mega Tram tour and take an underground guided tour of the cavern. 1841 Taylor Ave, Louisville, KY 40213, (877) 614-6342. The Old Spaghetti Factory – Normally, I like to try local non-chain restaurants when I’m in a new city but since we had our two picky eaters with us, we opted to go to The Old Spaghetti Factory. Another restaurant we were able to walk to from our hotel. I loved the historic building and the kids loved sitting in the trolley car in the center of the restaurant. You can’t go wrong with kids and pasta and since their meal was all inclusive (including dessert and a drink), it was also a fairly inexpensive dinner out for a family of four. Kids meals range from $5.59-$5.79. 235 West Market Street Louisville KY 40202 US, 502.581.1070. 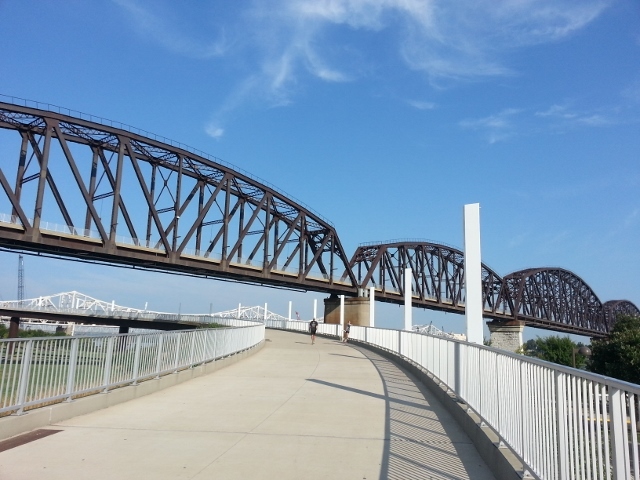 The morning we checked out, I took the girls to the Big Four Pedestrian and Bicycle Bridge. I wish we had more time since you can actually walk all the way from the KY side to the Indiana side of the bridge. We only got half way. So on our next trip, we are going to rent bikes and explore more of Waterfront Park. 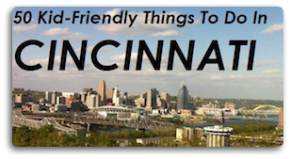 There were plenty of other attractions we didn’t get to see on this visit including Churchill Downs which is home of the Kentucky Derby Museum, Kentucky Science Center, Muhammad Ali Center, Frazier History Museum, Glassworks, Falls of the Ohio State Park, and much more. 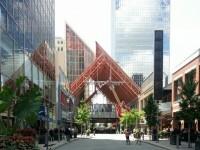 Need additional planning tips then visit www.gotolouisville.com for more information.